Background: At the University College Hospital (UCH), Ibadan, there is a policy of compulsory blood donation by relatives of pregnant women registered for care. This study assesses the perception of these women about blood donation and transfusion and compliance with the policy. Materials and Methods: This cross-sectional study was among women registered for antenatal care at UCH. By nonprobability purposive sampling, 300 pregnant women >18 years were recruited from July 1, 2017, to September 30, 2017. Women presenting for emergency care and Jehovah's Witnesses were excluded from the study. Information was obtained using pretested questionnaires. Data are presented as means (standard deviation), simple frequency, and percentages. Results: Among the 300 participants, the mean age was 31.0 (±3.7) years, 194 (64.6%) were multiparous, 94.4% had postsecondary education, and 263 (87.7%) were Yoruba by ethnicity. Concerning perception about blood donation, 221 (73.7%) agreed that blood can be donated and stored for the future use, 279 (93.0%) thought that blood donation is good, 214 (71.3%) agreed that voluntary blood donation is best, and both men and women could donate (269, 89.7%). Concerning the effect of blood donation, 229 (74.6%) agreed/strongly agreed that donation could cause weakness. However, 195 (65.0%) and 194 (64.0%) disagreed/strongly disagreed with donation causing loss of sexual drive or death. Concerning transfusion, 273 (90.7%) and 253 (84.3%), respectively, agreed that women may need blood during pregnancy/delivery, and hemorrhage during labor/delivery may lead to death. Finally, 266 (88.7%) were aware of the hospital policy although only 133 (44.3%) had complied. Conclusion: The positive perception was unmatched with compliance suggesting unidentified factors for further research. Keywords: Blood donation; blood transfusion; perception; pregnancy. Maternal mortality has continued to attract worldwide attention because most of these deaths are preventable. Although the latest figures quoted by the World Health Organization (WHO), 216/100,000 live births,, demonstrate a downward trend, the situation remains worrisome in the developing countries. In Nigeria, for example, the latest Demographic Health Survey puts maternal deaths at 576/100,000 live births while even higher figures are quoted by the WHO., Obstetric hemorrhage accounts for about 27.1% of maternal deaths, and higher percentages may be seen in settings such as observed in many countries in Sub-Saharan Africa, where blood banking facilities are often poor., Indeed, interventions that aim to reduce maternal deaths from hemorrhage must address the nonavailability of safe blood for transfusion. Unfortunately, in many resource-constrained settings, Nigeria inclusive, safe blood remains a scarce resource. At the University College Hospital (UCH), Ibadan, in a bid to ensure readily available and adequate supplies of safe blood, various measures have been put in place. These include the existence of a fully functional blood banking services accessible 24 h a day, a recently instituted mobile blood banking facility and a policy of compulsory blood donation by relatives of pregnant women registered for care. In addition, there are several private blood banking facilities in the environs of the hospital that supplements supply of blood units. However, despite all these measures, readily available blood for emergency obstetric care remains a challenge in the hospital. It has also been observed that many registered women still present in labor having not ensured blood donation by a relation. We, therefore, determined to assess the perception of these pregnant women about the practice of blood donation and transfusion and their compliance with the hospital policy of compulsory blood donation. This descriptive cross-sectional study was conducted among pregnant women registered for antenatal care at the UCH, Ibadan, an 880-bedded tertiary facility owned by the federal government of Nigeria and strategically located in the urban city of Ibadan. The antenatal clinic runs four times a week (Monday to Thursday). On Wednesday, only new patients presenting for registration are attended to. Using a nonprobability purposive sampling technique, 300 pregnant women were recruited between July 1 and September 30, 2017. To be eligible for the study, the pregnant women had to have registered for antenatal care, be above 18 years of age and be able to give consent. Those not eligible included pregnant women attending for the first time and pregnant women not registered for antenatal care but were presenting for emergency care. Finally, also excluded were pregnant women who were Jehovah's witnesses. Eligible women were interviewed using pretested, semistructured, close-ended questionnaires administered by two trained research assistants. The questionnaires sought information on sociodemographic characteristics, perception of the pregnant women about the practice of blood donation, the practice of blood transfusion, and compliance with the hospital policy of compulsory blood donation by the relatives of registered pregnant women. The respondents who could not read English language were assisted in filling the forms by the research assistants. All aspects of the study strictly followed the principles of the revised Helsinki declaration. Data were entered and analyzed using the IBM SPSS Statistics for Windows, Version 20.0. (Armonk, NY: IBM Corp). It is presented as means (standard deviation), simple frequency, and percentages. Among the 300 pregnant women recruited for the study, the mean age of the study participants was 31.0 (±3.7) years. 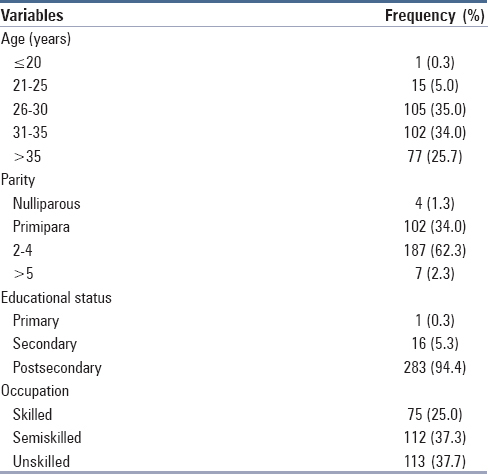 [Table 1] describes the sociodemographic characteristics of the pregnant women. Over two-thirds, 207 (69.0%), were between 26 and 35 years of age while 194 (64.6%) of the respondents were multiparous. Majority of the respondents (283, 94.4%) had postsecondary education, only 75 (25.0%) of the women were involved in skilled employment, and all the women were married. Similarly, 229 (76.3%) practiced Christianity and 71 (23.7%) practiced Islam. Two hundred and sixty-three of the women (87.7%) were Yoruba by ethnic origin, 20 (6.7%) were Igbos, and 2 (0.6%) of Hausa extraction. The remaining 15 (5.0%) were made up of a variety of ethnicities and nationalities. [Table 2] describes the perception of the pregnant women about the practice of blood donation. Two hundred and twenty-one of the respondents (73.7%) believed that blood can be donated and stored for the future use. Majority, 279 (93.0%), thought that the practice of blood donation is good while 222 (74.0%) thought that blood donation is safe. Two hundred and fourteen (71.3%) and 269 (89.7%), respectively, agreed that the best source of blood is the voluntary blood donor and that both men and women could donate. Finally, 164 (54.7%) of the respondents were not aware of how frequently an individual could donate blood. [Table 3] describes the perception of the women about the effect of blood donation on the donor. Two hundred and twenty-nine (76.4%) agreed or strongly agreed that blood donation could cause weakness. However, 195 (65%), 169 (56.3%), and 194 (64.0%), respectively, disagreed or strongly disagreed with blood donation causing loss of sexual drive, convulsions, or death. 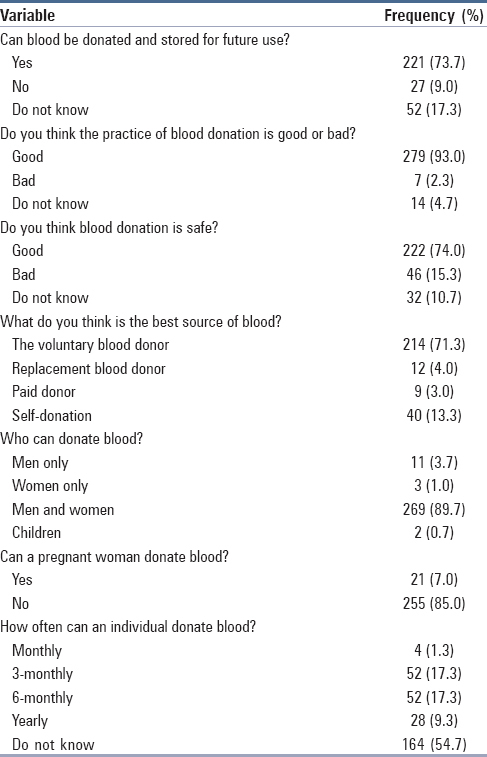 Concerning the perception of the respondents about blood transfusion [Table 4], 282 (94.0%) respondents agreed that blood from one person can be transfused to another person while 273 (90.7%) acknowledged that women may need blood during pregnancy/delivery. 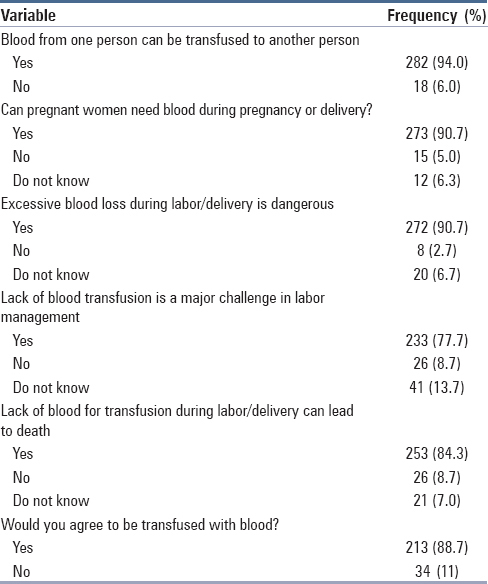 In addition, 272 (90.7%) agreed that excessive blood loss during labor/delivery is dangerous and 253 (84.3%) responded yes when asked if lack of blood for transfusion can lead to death. Finally, while 266 (88.7%) women admitted to being aware of the hospital policy that every pregnant woman registered for antenatal care should have someone donate blood on her behalf before delivery only 133 (44.3%) had complied [Figure 1]. Antenatal blood donation policy is not unique to our center and has been in existence in this center though not fully implemented. It is reassuring that our study revealed a positive perception among most of the women toward blood donation as most agreed that the practice is safe and good. Their perception about blood transfusion was also positive as most agreed that lack of blood for transfusion during labor can lead to death, and they would accept to be transfused if necessary. The positive perception toward blood donation and transfusion may not be unconnected with the educational level of the participants which was generally high. Our findings are similar to those of several workers in various regions of Nigeria and even outside Nigeria who noted that a high literacy level correlated with positive attitude toward blood donation.,,,,,,,, However, despite the positive perception observed, less than half had complied with the hospital policy of each pregnant women ensuring someone had donated for her before delivery. Most respondents believed that both men and women could donate although very few agreed to pregnant women being donors. Men have always been the major blood donors because they are physiologically endowed with higher hemoglobin levels which make them more suitable to donate blood. Women, on the other hand, constitute a minor proportion of blood donors. Apart from being physiologically disadvantaged with lower hemoglobin level, poverty, malnutrition, repeated pregnancies, food taboos, and negative cultural norms contribute to perpetual anemia in women in the developing countries. While most respondents agreed to blood donation leading to weakness, most disagreed with it resulting to loss of sexual drive or leading to convulsion and/or death. Fear of physical harm has been noted to be a major demotivating factor for nondonors. Umeora et al. in their study that explored sociocultural barriers to blood donation identified barriers to voluntary blood donation as including not feeling well, fear of collapse or death or illness or loss of libido. It has, however, been noted that fear of possible health effects from blood donation among unwilling donors is misguided. The provision of appropriate information has been advocated as being able to improve people's attitudes and correct some of these misconceptions. This is because individuals with higher knowledge score regarding blood donation are more likely to donate. Therefore, providing more information about blood donation will be an important tool in increasing the number of donors. Majority of the respondents in this study knew that lack of blood for transfusion is of considerable challenge in labor management and that excessive blood loss can lead to death similar to the findings by Balogun et al. and Ameen et al. both in Ilorin., Despite this knowledge, less than half of the respondents (44.3%) reported having had someone donate blood on their behalf. This is truly disturbing when compared with their high literacy level, apparent understanding of the benefits of blood donation, and agreement with the hospital policy of blood donation. Possible explanations for this include a lack of suitable donors and sociocultural beliefs toward blood donation. However, this study did not explore these issues, and they can form the basis for further research. In addition, there are reports that antenatal clinic attendees may not discuss issues such as blood donation with their spouses. In the study by Ameen et al. where they reviewed the source of information on antenatal blood donation among adult men, they noted that the spouse was the lowest means of information on antenatal blood donation in their study group. They concluded that wives hardly discuss antenatal issues with their husband as only 3.6% of the respondents got awareness about antenatal blood donation through their wives in this population. This observation was in consonance with the finding by Olayemi et al. in Ibadan that antenatal attendees do not think that their husbands need to either attend antenatal clinics with them or participate in counseling sessions. Despite the seeming positive perception of this group of pregnant women toward blood donation and transfusion, there was not a comparable compliance with the hospital policy of compulsory blood donation. No doubt the government, health-care providers, the pregnant women, and their partners/relatives all have roles to play in improving maternal health and reducing maternal mortality. Government should consolidate on the favorable perception toward blood donation through increasing public awareness in the media about blood safety and the importance of safe voluntary nonremunerated blood. Health-care providers should ensure patients, and their partners are educated on the benefits of blood donation and transfusion and dangers of blood loss in labor management. These efforts will hopefully result in improved motivation to donate blood and contribute to reducing maternal mortality. Udoma EJ, Itina SM, Ekanem A, Mboho MM. Prevention of maternal mortality by training the birth attendants of church-based maternity homes in Akwa-Ibom State. Trop J Obstet Gynaecol 2005;22:180-3. WHO/UNICEF Revised 1990 Estimates of Maternal Mortality: A New Approach by WHO and UNICEF. WHO/FRH/MOH/96,11, UNICEF/PLN/96; 1996. United Nation Development Programme. Nigerian Human Development Report 2000/2001. Millennium Edition. Lagos Nigeria: United Nation Development Programme; 2001. Federal Ministry of Health. Maternal Mortality Situation and Determinants in Nigeria. A Review Commissioned. Abuja: Federal Ministry of Health; 2004.
WHO, UNICEF, UNFPA. Trends in Maternal Mortality: 1990-2013, The World Bank and the United Nation Population Division; 2014. Egwuatu VE. Reflection on Maternal Mortality in Nigeria: The Fifth Okoronkwo Kesunda Ogan Memorial Oration. Trop J Obstet Gynaecol 2003;20:76-82. Maternal Mortality Rate. Available from: https://www.cdc.gov/nchs/data/series/sr_10/sr10_256.pdf. [Last accessed on 2017 Dec 27]. Moltzan C, Proulx N, Bormanis J, Lander N, Degroot H, Rock G. Perceptions and motivations of Canadian autologous donors. Transfus Med 2001;11:177-182. Sandborg E. Getting people to give blood. Vox Sang 2000;78 Suppl 2:297-301. Moore RJ. Promoting blood donation: A study of the social profile, attitudes, motivation and experience of donors. Transfus Med 1991;1:201-7. Adamu YM, Salihu HM. Barriers to the use of antenatal and obstetric care services in rural Kano, Nigeria. J Obstet Gynaecol 2002;22:600-3. World Health Organization. Reduction in Maternal Mortality. A Joint WHO/UNFPA/UNICEF/WORLDBANK Statement. Geneva: World Health Organization; 1990. p. 10-3. Balogun OR. Raji HO, Adesina KT, Fawole AA, Aboyeji AP, Jimoh AG. Knowledge and attitude of pregnant women, towards antenatal blood donation policy in the University of Ilorin teaching hospital. Niger J Health Sci 2009;9:98-103. Obi SN. Antenatal blood donation for pregnant Nigerian mothers: The husbands' perspective. J Obstet Gynaecol 2007;27:467-9. Javadzadeh Shahshahani H, Yavari MT, Attar M, Ahmadiyeh MH. Knowledge, attitude and practice study about blood donation in the urban population of Yazd, Iran, 2004. Transfus Med 2006;16:403-9. Ameen HA, Isiaka-Lawal S, Okesina BS, Shittu RO, Sanni MA, Uthman MM, et al. Willingness to support antenatal blood donation among married men in a metropolitan city in North-central Nigeria. Niger Postgrad Med J 2015;22:169-73. World Health Organization. Reduction of Maternal Mortality. A Joint WHO/UNFPA/UNICEF/World Bank Statement. Geneva: World Health Organization; 1999. p. 4-19. Anorlu RI, Orakwe CO, Abudu OO, Akanmu AS. Uses and misuse of blood transfusion in obstetrics in Lagos, Nigeria. West Afr J Med 2003;22:124-7. World Health Organization. Making Pregnancy Safer; the Critical Role of the Skilled Attendant. A Joint Statement by WHO, ICM and FIGO. Geneva: World Health Organization; 2004. World Health Organization. Averting Maternal Death and Disability, UNFPA, UNICEF. A Handbook on Monitoring Emergency Obstetric Care. Geneva: WHO; 2009. Family Care International Inc. Gynuity Health Projects – Postpartum Hemorrhage; a Challenge for Safe Motherhood; New York: Family Care International Inc.; 2006. Olawumi HO, Adewumi JO. Blood donation trends in a tertiary hospital in Nigeria. Savannah J Med Res Pract 2012;1:25-8. Aziken ME. Anaemia in pregnancy. In: Okpere E, editor. Clinical Obstetrics. Revised Edition. Benin: Uniben Press; 2003. p. 51-5. Chliaoutakis J, Trakas DJ, Socrataki F, Lemonidou C, Papaioannou D. Blood donor behaviour in Greece: Implications for health policy. Soc Sci Med 1994;38:1461-7. Olayemi O, Bello FA, Aimakhu CO, Obajimi GO, Adekunle AO. Male participation in pregnancy and delivery in Nigeria: A survey of antenatal attendees. J Biosoc Sci 2009;41:493-503. Blood donation; blood transfusion; perception; pregnancy.